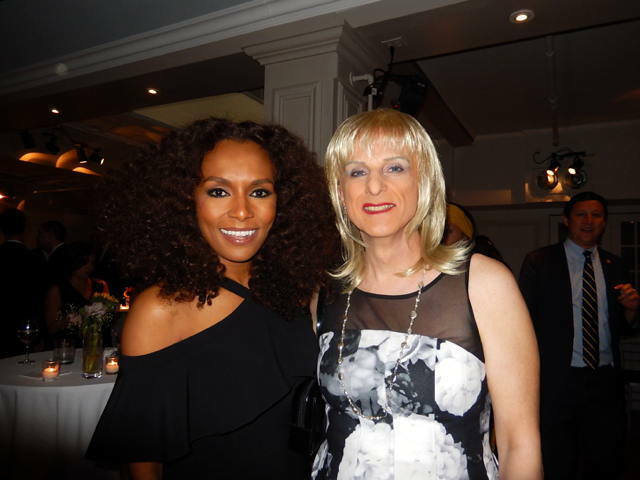 Your reporter Angela Gardner with MC Janet Mock. New York City — The Transgender Legal Defense & Education Fund held their 2017 Freedom Awards ceremony last Thursday, June 8, 2017 in Manhattan. The Fund was founded in 2003 and is a 501(c)(3) nonprofit whose mission is to end discrimination and achieve equality for transgender people, particularly those in the most vulnerable communities. They provide free legal name change services to the trans community and weigh in on trans rights legal cases with “friends of the court” briefs on key issues such as employment, health care, education, and public accommodations. Their Freedom Award recognizes those who have helped work toward that goal. The evening started at 6:30 with cocktails; bountiful tables of cheese, fruit and crackers bolstered by hors d’oeuvres presented by wait staff circulating through the crowded room. TLDEF Executive Director Jillian Weiss took the podium later to introduce the hostess of the evening Janet Mock. Ms. Mock is an American writer, TV host, transgender rights activist, author, contributing editor for Marie Claire, and former staff editor of People magazine’s website. Freedom Awards were given to law firms that have partnered with TLDEF to advance trans rights and equality, Cleary Gottlieb and BakerHostetler. Jennifer Chavez, who turned to TLDEF for help with her employment discrimination case, told the crowd about her experience. After some on-the-spot fundraising using text messaging conducted by a TLDEF board member and their Director of Development Melissa Sklarz it was time to present the final award of the evening which went to New York Governor Andrew Cuomo for taking steps to implement protections for trans people through executive action after years of road blocks for an anti-discrimination bill in the legislature. Gov. Cuomo did not personally accept the award but sent Chief Counsel Alphonso B. David who accepted the award on his behalf. Then Ms. Weiss introduced the TLDEF staff members to the crowd and it was time for photos with Ms. Mock, and more mingling after a successful event. For more information on the organization and to make an online donation visit their website. To view the photos from the Freedom Awards click on the first thumbnail below. Navigate through the photo using the << >> navigation tools that will be displayed on the photo. Click in the last photo to return to this page. To look at the next gallery click the #2 under the thumbnails.